Makeup is a lot of different things to different people. For some it’s a comfort blanket, for me, it’s a job, and for all, it’s an opportunity to have fun and get creative. Ever since my first dabble with nail polish as a child, I have always looked for new ways to experiment and improve my makeup skills. 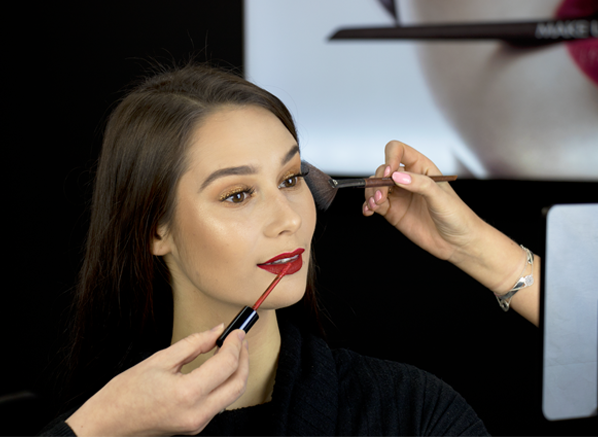 From mastering a cat-flick to applying false lashes, there are always new things to learn and try, even for the professionals! Glitter can be a little daunting, but it needn’t be. If you find the right formula it can look eye-catching, glamorous and really make your look pop. One of the best things about glitter is that it’s easy to apply, so even beginners can achieve a great result that looks professional. Above I have used the MAKE UP FOR EVER Diamond Powder in 4 Bronze all over the lid, I dampened my brush (Precision Shader Brush – Medium 228) with the MAKE UP FOR EVER Mist & Fix Spray to pick up more pigment and the result was a beautiful golden bronze eye that took seconds to achieve. Tip: To avoid touching up your under eye concealer or base because of glitter fall-out, apply the glitter first all over the lid and then continue with your base. I’ll be the first to admit that it took me a little while to get to grips with false lashes. However, there’s no denying that they can really transform a makeup look. The trick to getting false lashes right is time; don’t rush or you’ll end up ruining your eyeshadow and your party mood while you’re at it. Above I’m wearing my favourite MAKE UP FOR EVER Lash Show Natural Impact False Lashes in N-404, they’re fluttery and full without being heavy or too harsh looking on the eyes. Light and comfortable, the strip is easy to manipulate and shape to your eye, which makes application a walk in the park. Tip: If you’re confident with your eyelash application try wearing them underneath your lashes. This is how I have them above and it works great when you’re not wearing eyeliner. Apply the glue to the top of the strip and hold it underneath the lash until attached to the lash hairs – it’s far more comfortable too! There’s no lip product more appropriate for New Year’s Eve than a liquid lip. Choose the right one and you can eat, drink and kiss your way to the countdown without having to touch-up once. My holy grail choice is the MAKE UP FOR EVER Artist Liquid Matte Lip Color in 401 Red, a classic crimson red that is destined for the festive season. But, it’s beautiful hue is only a small part of why I love it, the main thing being that it lasts and lasts without drying out or wearing away in the centre of the lips. 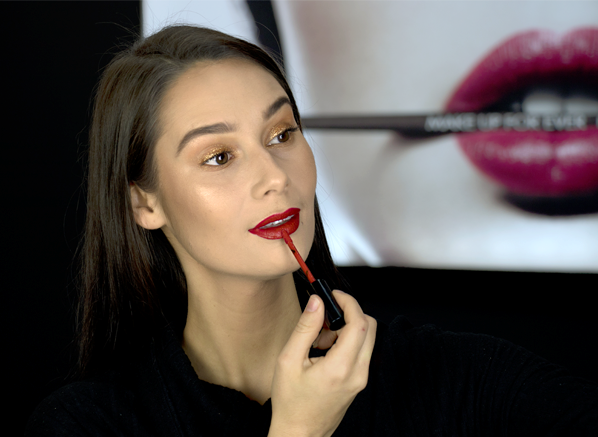 2017 has been the year of the liquid lip for me and I am not looking back, so if you’re yet to try one make sure you do in 2018! Tip: For enhanced longevity pair with a lip liner, then apply a layer all over the lips, wait to dry and apply another to lock in the colour. We live in an age where cameras are flashing every few minutes. 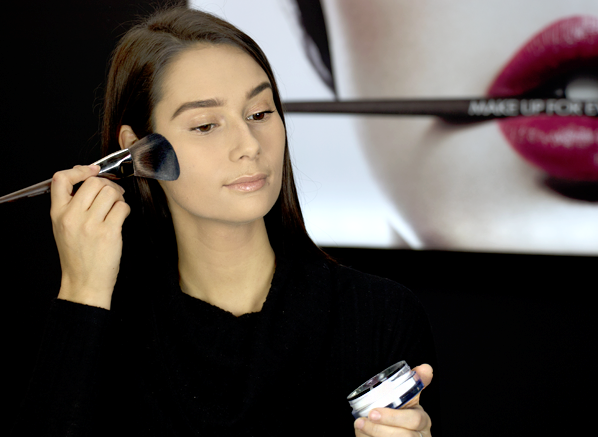 From selfies to in-club photographers there’s often no way of avoiding a photo opportunity, so I suggest trying out the MAKE UP FOR EVER Ultra HD range. The Ultra HD range is the secret to photo-perfect skin. It’s formulated with the latest high definition technology to blur imperfections and smooth the skin’s surface, for a flawless-looking complexion both on and off camera. My favourite and the favourite of many makeup lovers is the MAKE UP FOR EVER Ultra HD Loose Powder, a setting powder that sweeps over the complexion and instantly makes your skin look filtered. A cult product in its own right, this little gem will completely change how you feel about impromptu pictures, and it may even make you start asking for some! Tip: You can use this loose powder to set your under eye makeup after applying concealer to minimise creasing and brighten the area. Once applied leave to sit (often referred to as baking), then dust off the excess after around 5 minutes. A dusting of highlighter can transform a complexion from dull to mesmerising in the drop of a hat. For me, my makeup is incomplete without it and I would feel naked leaving the house without a glow. 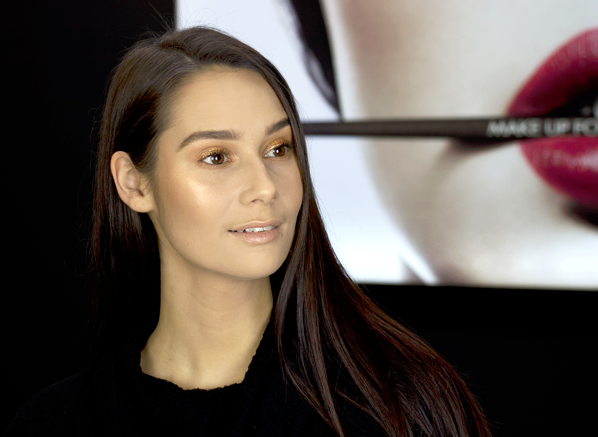 So, my final tip for a stand out makeup look is finding a highlighter that’s best suited to you. Whether that’s a subtle healthy glow or a show-stopping beam of light, highlighter can help you get a supermodel sculpted look in seconds. The highlighter I return to time and time again is the MAKE UP FOR EVER Pro Light Fusion Undetectable Luminizer in 2 Golden, because I cannot get enough of its ethereal golden hue and silken formula. 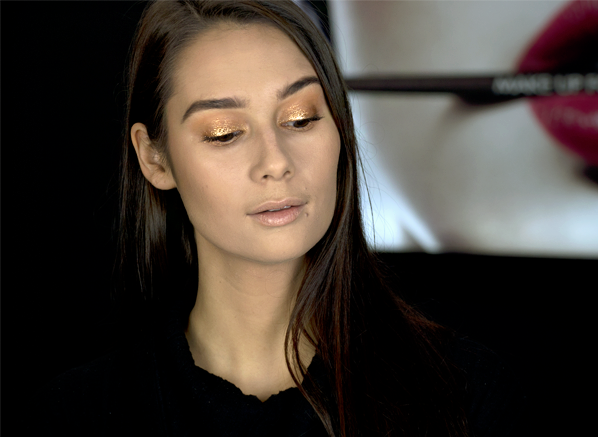 Perfect for paired back looks or a layered glow, this shimmering golden hue instantly illuminates the complexion and will always prompt the question: “what highlighter are you wearing?”. Tip: Don’t just highlight your cheekbones, apply highlighter to your brow bone, cupid’s bow and your temples for all-over radiance. This entry was posted on Friday, December 29th, 2017 at 9:14 am and is filed under Hints & Tips, Make-up, Spotlight On, Swatches, Trends, Tried & Tested. You can follow any responses to this entry through the RSS 2.0 feed. You can skip to the end and leave a response. Pinging is currently not allowed.